Today’s vacation outings included a trip to the Wolf Sanctuary of Pennsylvania. Though wolves and humans alike were wilting in the 94-degree heat, it was an interesting tour. The animals’ individual stories were sometimes heartbreaking—most of them had been removed from owners who kept them illegally, often in poor conditions. The wolves, kept in small to medium-sized ‘packs’ throughout the 80 acres of the sanctuary, ranged from the friendly young one who begged the keeper for a scratch through the fence, to the wary animal (kept for nine years on a chain in someone’s back yard) who wouldn’t come near the fence, even for a venison snack. 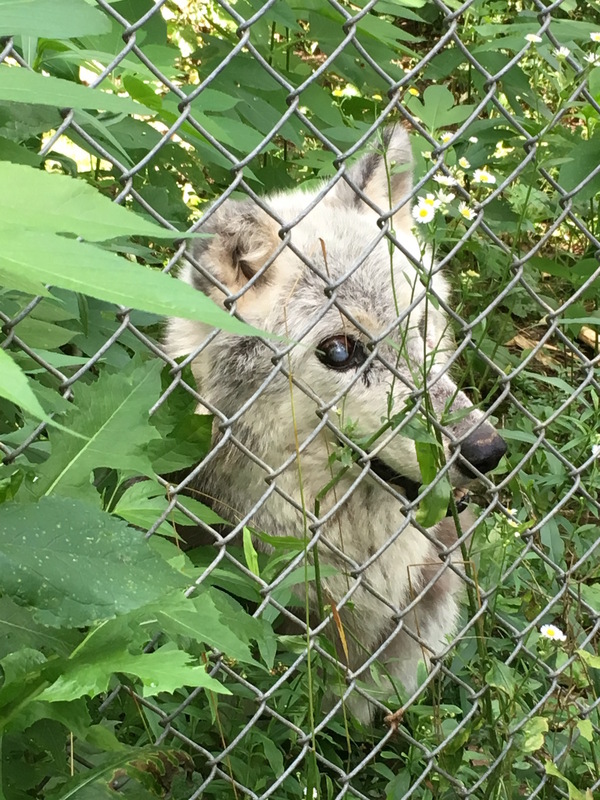 The wolf pictured here was happy to approach the fence and display his remarkable sense of smell. As you can see in the photo, he is blind—cataracts. In the wild, a blind wolf would be driven from his pack—there’s no room for disability in the wild (at the sanctuary, he is kept in a pack of two to avoid this). In captivity, he clearly thrives, making his way by smell and hearing. While we watched, he sniffed out a chunk of meat thrown into the undergrowth, and our guide related how he had once caught a rabbit that wandered into his enclosure. Seeing these wolves in captivity was nothing like hearing wild wolves howl at night in northern Minnesota. And the stories of how they cam to be at the sanctuary are a terrible symptom of humans’ desire for mastery over wild animals. But I was glad for the opportunity to see these marvelous animals up close, an to know that in spite of their sad pasts, they are now being cared for with compassion and respect for their physical and social needs.